Contract Drafting and Disputes | Law Offices of Martin & Hipple, P.L.L.C. 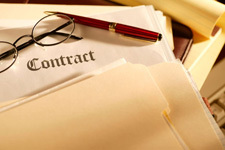 Whether it is a lease, an employment contract, a distributor agreement, or a buyer/seller agreement, people quickly find that poorly-drafted contracts cause problems and cost money when there is a misunderstanding down the road. Most relationships start with high hopes, but well-drafted contracts ensure that the parties’ original intentions are carried out fairly when things that can go wrong do go wrong. If you want a contract drafted or want to protect your rights in a contract dispute, call Martin & Hipple.